It was the battle of the “Caps” at Parkview Field on Wednesday morning as the Fort Wayne TinCaps hosted the West Michigan Whitecaps in the rubber match of their three game series. The TinCaps (5-8) sent starter Jesse Scholtens to the mound to face the Whitecaps (6-7) Kyle Funkhouser. 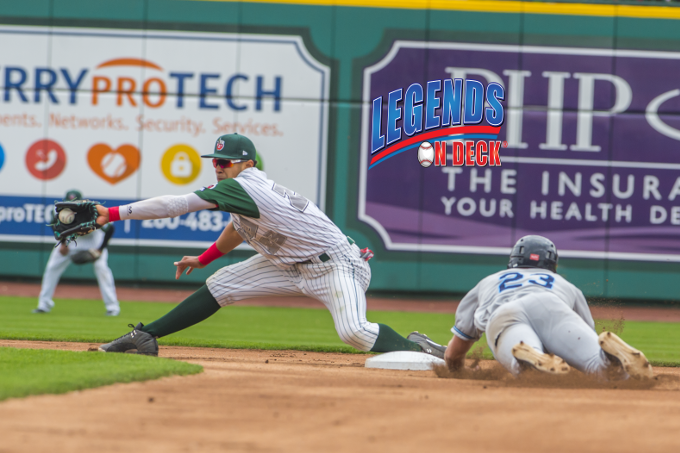 The runs were few and far between in the TinCaps 3-2 victory as both pitching staffs were able to keep the ball in the ballpark, work around a couple of jams, and only issued a combined two walks on the day. The game did get off to a quick start as the Whitecaps struck for one run in their half of the first when Cam Gibson scored on a Blaise Salter sacrifice fly. The TinCaps wasted no time tying things up as they answered with a Hudson Potts triple that drove in Jorge Ona. The scoreboard was silent until the top half of the third when a Cole Bauml ground out drove in Gibson who had notched his second hit of the day earlier in the inning with a one out triple. Scholtens would go on to shut down the Whitecaps bats and those would prove to be the only two runs he would allow through seven innings while giving up five hits, striking out five, and walking none. The back and forth battle continued in the bottom of the fifth when Marcus Greene led off with a double, then advanced to third after a wild pick off attempt from Funkhouser. Funkhouser looked like he may pitch his way out of it as he would strike out the next two batters, but with two outs, Reinaldo Ilarraza poked a single to the third baseman, Anthony Pereira, who would end up throwing the ball away. After 4 2/3, that was the end of the road for Funkhouser. He ended up allowing two runs, one of them earned, and struck out a total of nine TinCaps. Fernando Perez would come into finish the game for the Whitecaps and was solid, retiring nine of the first ten batters he faced until unraveling in the bottom of the eighth. A two out single from Potts, followed by a wild pitch allowing him to advance to second, had Fernando Tatis Jr. standing at the plate with the go ahead run in scoring position. Tatis, who had coincidentally drove in the game tying run and scored the winning run in the bottom of the ninth the night before, singled home Potts for what would ultimately be the winning run. Ben Sheckler, who had come on in relief for Scholtens in the eighth, would finish out the ninth and pick up his second win on the season. There was a scary moment in the bottom of the eighth when home plate umpire, Matt Cowan, took a foul ball to the facemask, forcing him to leave the game as we had finish with just one umpire. Fort Wayne improves to 5-8 on the season and currently sit in seventh in the Eastern division. They hit the road for a seven game road trip which starts with four games against the defending MWL champs, the Great Lakes Loons, and then wraps up with a three game series against these same West Michigan Whitecaps. The Whitecaps return home with a 6-7 and will open up their home stand against the Lake County Captains.